Em's Knitty Corner: Input wanted! I could really use your opinions and input here! They are no longer going to be my sockapaloooza socks. They are to small and the whole design isn't working out the way I wanted it. I will rip the heel and do a short heel and keep them for myself (they just fit me, to much of a risk to send them to my pal I'm afraid). Instead of starting the same socks over again I went shopping for some simple yarn, and started thinking something out. My pal loves the more classical design for socks, so I decided to go with something simple. The colour isn't true in this picture (it's more like a pale blue, jeans-like). But you can see the pattern. 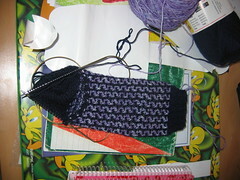 I'm using a twisted stitch for the leg, with a nice lace pattern running down both sides of the sock. This will continue down the foot. The pattern is really stretchy and I do like it, especially the way the twisted stitches are working out (which you can see vaguely in the picture). But isn't this to simple for my sockpal? She works a lot and wanted sturdy, machine washable socks. I think she might like this. I didn't want a sock that was to complicated as for the pattern as it's not always comfortable to wear those socks in work shoes. Please, please comment! I need some advise now as I really want to finish this socks soon! The deadline is really approaching fast! 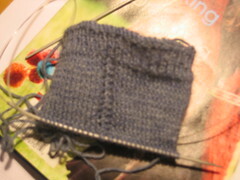 I like the new sock - and it looks very nicely knit, too. I think your sock will be fine! And you are right that bkjsimple socks are comfortable to wear. If she likes classical socks, she'll surely like these. A simple, but interesting design, in a lovely yarn, and comfortable to wear too. I'd say go for it! I like the design, I wish my monitor showed the true color. Classic socks are always great. Heck, any handknit sock is a great gift if you ask me girl! I think you've bridged the gap well: a basic, attractive sock with just enough interest for both of you. :) Plus, since it's mostly St st, I think it'll be comfy in work shoes. I think you've taken a great approach. You can't go wrong with a classic sock, in a beautiful color and the addition of the twisted sts just gives it a hint of fun. Lovely choice!